Northern delegates to this year’s annual DX Convention held at Invercargill and Riverton Rocks on the weekend of February 21-22, no doubt thought that their hosts – the Southland Branch were staging miniature Operation Deep Freeze conditions when they were taken DXing at the Rocks on Saturday night. Temperatures were low, a strong and cold wind blew from the south to give an added touch to conditions as conventionites trudges in. Ed Hilary expedition style to the top of a sandhill promontory overlooking Fouveaux Strait. 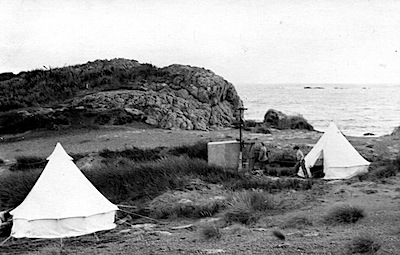 At the summit, the famous 6ft x 3ft DX listening post – the most southerly DX station in the world – and two Bell tents were located behind a rock hill that offered a little protection from the cold wind. Lower down on the flat ground the third tent had been erected for DXing. The convention was organised by the Southland branch and was the second time they have played hosts since these events began five years ago. The weekend got under way when DXers first met in South Invercargill and were handed a folder containing a fistful of maps of various towns and the route to Bluff, a sample packet of tea, and name-tag which was worn by each delegate. The convention issue of the SOUTHLAND DX DIGEST with its feature articles on DX and the city provided interesting reading as well as giving data on the weekend. As indication of how Southland is forging ahead in the march of progress was clearly seen when convetionites traveled 17 miles to Bluff to see the 3.5m pound harbour scheme. The massive project was viewed from the top of Bluff Hill while Southlanders proudly passed around oysters straight from the famous oyster beds in Fouveaux Strait. On the way out a new fertilizer works was seen while motorist members viewed the latter part of the trip as somewhat of a reliability trial as graers worked on the new four-lane highway from Invercagill. A tour of Bluff-the most southerly borough in the world was made before heading back to Invercargill. A trail of empty ice-cream cartons covered the road after members had consumed numerous blocks. An interesting visit was made to the Post Office radio station ZLB at Awarua on the way to the city. DXers were obviously in their element when they were given the opportunity of twirling the dials of 250 pond Philips receivers. Although lacking the complete broadcast band the sets would be a welcome asset in any DXers home. Members heard signals from ships, coast stations as well as broadcasting stations. After taking a brief look at the Anderson Park Art Gallery in the afternoon, the car loads of DXers headed to the oldest DX listening location in New Zealand at Riverton Rocks. It is here that Merv Branks has carried out his DXing for the past 25 years. At the Rocks, Merv, who is Southland Branch president extended an official welcome to the 25 conventionites in a brief teatime function. Telegrams were received from the Auckland Branch, Maurice Enright and Frank Wilson of Roxburgh. After an enjoyable tea members took up DX “action stations” in the hut and tents where, for the next eight or nine hours members tuned in to the world on broadcast. In “Station No 1” – the hut, Arthur Cushen, Sutton Burtenshaw, Ken Mackey, Don Reed and Merv Branks squeezed into the latter’s amazing hut. A short distance away Keith Robinson, operated “Station No 2” in a tent. Obviously well aware of climatic conditions Keith wore a heavy coat. Des Frampton’s set failed to go in “Station No 3” and members went to other tents. Down at the foot of the hill Eric McIntosh in “Station No 4” had a large gathering. At 9:30 the first supper took place after which some returned to the tents, while others set up receivers in the cribs and DXed in comfort. The shortwave boys took up a position in Merv’s crib beside a roaring fire and DXed on a Eddystone 840A receiver. DXing continued throughout the night and early morning with cups of tea helping the keen stay awake. The last group closed down at 5 a.m. A meeting held on Sunday morning discussed membership and certificates. This was followed by “Aerials and Other Aids to DX” introduced by Merv and speakers were Ken Mackey, Don Reed and Arthur Cushen. After a scrumptious dinner and the official photograph had been taken conventionites said their farewells and another successful DX convention came to a close. To the organiser, Merv Branks, the convention committee and Southland members we say thankyou for a wonderful weekend – a weekend which once a year DXers can meet and make new or renew friendships, talk DX and log stations. Its a function that is becoming a DX League tradition, and we look forward to the next. Well done Southland. Good reception conditions prevailed on both broadcast and the shortwave bands to allow 193 loggings to be made by the 25 conventionites. Reception in the early evening on broadcast was good for the Rocks where signals are usually later in coming through than further north. Conditions opened up between 2 and 3.15 a.m. when some excellent Pacific Coasters came through. Don Redd’s effort of nine loggings in 70 mins speaks for itself. Though by no means the most distant 250 watt station hear, KIEW was the most difficult to log. The difference of noise level between battery and power was most noticeable, and the directional aerials were used to good use. Murray Lamont reported an excellent night at Long Beach, with KENN loud and soem heavy QRM from WWOD — an interesting comparison. Asians were also heard at fair strength for so early in the season, and AFKN Pusan was an interesting logging in this area. When shortwave listening was begun late at night the first band tried was 49 when it had the usual prominent stations. It also produced an unidentified station on 6175 closing at 10:30pm and probably a North Korean. At 11, the 11 mtr band was coming in with BBC outlets and the 100 watt experimental Norwegian LLA on 25900 at fair level on opening. After midnight the 13 metre band yielded LLP and Belgium opening at 1 a.m. At 4a.m. British Somaliland was heard through interference and was followed by the SABC at good strength on the 31 metre band. The 60 metre band was not lively and little being noted except Goa at poor strength at this time. “Gee, I would hate to have been Scott” a northern DXer said as he made his way from one tent to another on the Rocks. Oh How Those DXers Can Eat! The proof of the pudding is in th eating they say and what 25 DXers can tuck away is revealed by the ration list. 60lb potatoes, a lamb, 5lbs peas, mixed vegs., 16lb savys, 2doz eggs, 4gallons milk, 6 large loaves of bread and many others. Under the direction of Cook Nevin Murch, his team of Dudley Carter, Eddie MacAskill and Norm Austin put on first class meals that brought forth many favourable comments. The icecream cakes-suitably decorated for the convention was just one of the good things that came from the kitchen. Well done chaps. Southland: Des Frampton, Allan Eunson, Neville Ross, Merv Branks, Eddie MacAskill, Alex Allen, Sutton Burtonshaw, Keith Robinson, Arthur Cushen, Eric McIntosh, Derek Howie, Stuart Hobbs, Fred Pigeon, Norm Austin, Nevin Murch, Dudley Carter. Canterbury: Anthony King, Don Reed. Wellington: Robin Bromby Otago: Des Lynn, Frank McKenzie, Jack Fox, George Beardsmore, Jack Blacklock, Ken Mackey..